Lauren London's been on her baddie video girl status lately. She appeared in her man Nipsey Hussle's latest vid, and now she's riding shotgun with Nicki Minaj. Onika just dropped the visuals for her twerk anthem "Good Form", and since she name dropped New New, she had to get LL to play the part. She tapped a few of her other fave bad chicks for the Queen track (one of our fave off the album, btw). 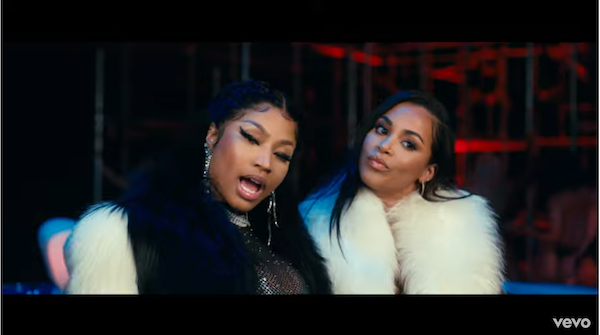 In addition to Lil Wayne, who's featured on the rack, she's got ex-Young Money squad member Tyga, Evelyn Lozada and her daughter Shaniece (who were handpicked for the vid), the Clermont Twins, and Nicki's bestie, former "Basketball Wives" star Brooke Bailey. And we can't forget, she tapped former stripclub bartender Jade as one of those twerk stars. Jade is currently filing suit on Cardi B. after that stripclub dustup over Offset. Jade is also dating Nick's friend and collabo partner, Tekashi 69. We guess Nicki is helping her un-stop her bag after the stripclub was shut down. And it looks like her hairstylist Arrogant Tae is back after he flipped out on the heavily critical Barbz.